When hanging a microwave, many people utilize the above cabinets. But for those of you who don’t have available cabinet space, don’t fret: you still have the option of hanging your microwave -- you’ll just need a wall mount. The mount enables the microwave to sit safely suspended above a counter or other area of the kitchen. After making a few holes with your drill, the wall mount will be ready for your microwave. 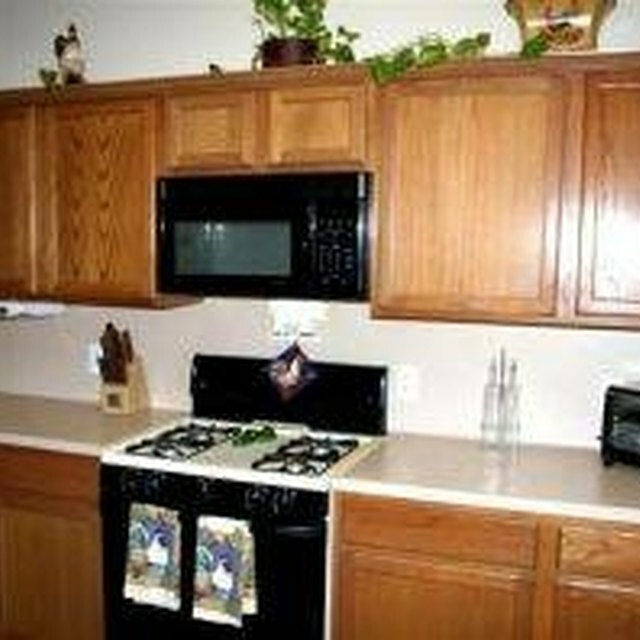 Cabinets make hanging a microwave easy, but they're not a necessity. Measure the dimensions of your microwave. The wall mount that you use must at least equal the length and width of your microwave. Ensure that the mount can support the weight of your microwave as well. Most microwave wall mounts state that the mount supports up to a certain microwave size. Screw the mount into the wall. Microwave wall mounts typically come in one of two styles: one solid mount that looks like a shelf and a mount that comes as two L-brackets. The necessary screws almost always come with the mounts. If you need your own screws, determine the size of the screw holes and use two to four toggle bolts to hold the mount in place. Place the microwave on the mount. Hold the power cord on the back of the microwave while you place the appliance on the mount to avoid having to readjust it later.